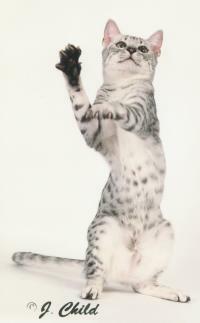 Animal Planet - Cats 101 Program: Egyptian Mau Segment Exciting News!! 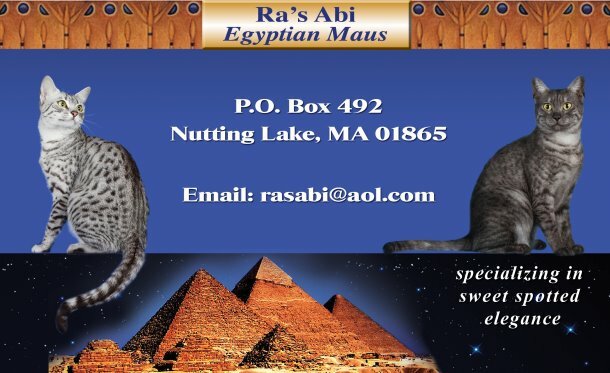 80% of the cats featured in the Cats 101 Program Egyptian Mau Segment were Ra's Abi's Maus!! Anya runs agility, Future takes a bath, and OG becomes a skeleton! The segment is being aired at various times by Animal Planet. Top Achiever Ra'sAbi Egyptian Maus has produced top quality examples of this beautiful spotted breed and is one of few catteries worldwide that has achieved 30+ Cat Fanciers Association granding titles, an outstanding achievement, especially for a small cattery! details and pictures of our Grands! The exotic good looks of the Egyptian Mau take us back through the ages to the jungle and then beyond to the pharaohs who worshipped and domesticated these intelligent hunting cats. We think of the maus as God's leopards thus the name of our cattery Ra's (Egyptian for God's) Abi (Egyptian for leopard), founded in 1998. We are a small cattery, located in the greater Boston area of New England, and specialize in silver and smoke Egyptian Maus. The health, temperament and quality of our breeding cats and the health, temperament and quality of the kittens they produce are of the greatest importance so we do not mass produce, but rather limit litters to one per year for each queen. Our maus are pampered from birth with lots of hands-on attention, toys, cat condos, scratching posts, and great food. These beautiful precocious high-energy green-eyed athletes do sleep with us when not playing. Our spotted beauties receive top-notch vet care and our kittens are very well adjusted socially when they join their new homes. We carefully screen every new owner and work with him or her on delivery arrangements and have not had to ship. Because the demand for this rare breed far exceeds the supply, we encourage those interested in acquiring a mau to consider being placed on our reservation list. With several thousand maus in the world today, we are devoted and committed to this rare exotic spotted breed to ensure that it continues to thrive. Our successful breeding program is a result of our genetic knowledge and careful, sound mating selections to ensure healthy, viable offspring with sweet temperments, exquisite spotty coats, and breathtaking beauty. We have committed our time, hard work, and resources to breeding, actively showing and competing, learning from, and educating others to ensure that this breed does not become extinct. Our mau travels have covered many miles and several countries on three continents so far (US, Canada, Spain, Italy, and Egypt)! We are proud to affiliate with and support the Cat Fanciers Association (CFA), the largest registry of pedigreed cats in the world. We compete primarily at CFA cat shows and are members of the Egyptian Mau Breed Council and founding members of the Egyptian Mau breed club, the Global Egyptian Mau Society (GEMS). We are also members of the New Hampshire Feline Fanciers and Seacoast Cat Clubs, both of New Hampshire. We also participate at the National/World Cat Show (2015, 2014 Philadelphia, PA; 2013 Detroit, MI; 2012 Colombus, OH; 2011 Indianapolis, IN), the CFA International cat shows (2009 Atlanta, GA; 2002, 2003, 2004 Houston, TX), and at CFA Meet the Breeds exhibition (2010 New York City). Both of us are active club members and work at hosting four shows each year to ensure that pedigreed cats can continue to compete and be seen by the public. Both of us hold or have held various club and officer positions including that of president, vice president and show manager. We also serve as ring clerks (both) and master clerk (Bob) at shows. We continue to show these wonderful cats to get objective feedback from CFA judges regarding our breeding program and to give the public the chance to see these extraordinary cats. Please visit the Show Stars page to learn more about the current cats you may see with us at shows. We look foward to meeting you there! Note: All pictures and graphics are copyrighted by Ra's Abi or individual photographers. No part of this web site may be reproduced in any form or by any means without written permission from Ra's Abi and the photographers.